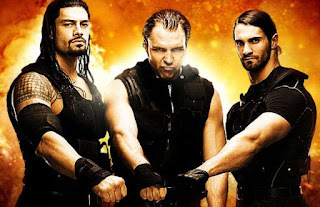 In late 2017, WWE pulled the trigger on a reunion of The Shield in a bid to try and get Roman Reigns more popular with the fans ahead of another WrestleMania push, and while the reunion and Reigns’ push both didn’t kick on the way they were intended, it did result in the release of the second career retrospective of the Hounds of Justice, following on from 2015’s “Destruction of The Shield”. 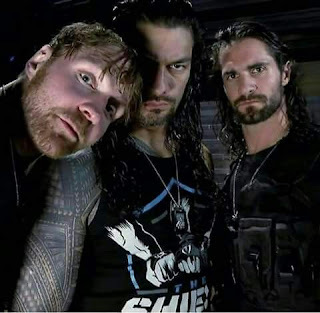 “The Shield: Justice for All” takes on a different format to the first collection – while “Destruction” repackaged a WWE Network documentary and included matches as a bonus, “Justice for All” features several new mini interviews with Reigns, Dean Ambrose and Seth Rollins, along with their peers, and pairs them with key matches from 2015 onwards. In total, there’s nearly 9 hours of action included, with several TV matches that have yet to be released on DVD. “The Lunatic Fringe” takes the focus of Disc 1, with Dean Ambrose’s story beginning here with his challenge of the newly-crowned United States Champion John Cena on the episode of RAW held the night after WrestleMania 31, which set the tone perfectly for Cena’s great run with that championship throughout most of 2015. The end of that year saw Ambrose enter a feud with Kevin Owens, and their battle for the Intercontinental Championship at TLC 2015 is showcased here, with Ambrose winning the title. In the buildup to WrestleMania 32, Ambrose entered a short rivalry with then-WWE Champion Triple H, and their match from Roadblock in Toronto for the title is included – a bout that proved to be far superior to what both men ended up doing in Dallas a few weeks later. A huge career break happened at Money in the Bank 2016, where Ambrose competed against Owens, Sami Zayn, Alberto Del Rio, Cesaro and Chris Jericho in the eponymous Ladder Match – while the result of that bout is featured on Seth Rollins’ disc, it led to the much-anticipated Shield Triple Threat Match, which surprised fans by taking place at Battleground 2016 rather than at SummerSlam that year. Ambrose enters as the newly-crowned WWE Champion looking to take the title to SmackDown Live against RAW’s Reigns and Rollins, and in the end manages to take the championship to Team Blue despite being outmatched physically and fitness-wise by his two former partners. The first SmackDown Live episode of 2017 sees Ambrose win back the Intercontinental Title against The Miz in an entertaining bout, an example of the regular great matches on SmackDown in that time-period. The final match on Ambrose’s disc sees him transferred over to RAW, detailing the lengthy build to his reunion with Rollins, as it was Ambrose who took Rollins’ betrayal in 2014 the hardest. They enter No Mercy 2017 as RAW Tag Team Champions against The Bar, a match made infamous by Cesaro badly damaging his teeth during the contest, but also showcasing how well Ambrose and Rollins had gelled back together again. Disc 2 looks at “The Architect” Seth Rollins, whose collection of matches starts later than his partners, as his heel run post-breakup is chronicled on last year’s “Seth Rollins: Building the Architect”. The first match of his collection also features on that DVD set, as he challenges Roman Reigns for the WWE Championship at Money in the Bank 2016, a match that sees him win back the title, but not for long, as Dean Ambrose cashes in on him to win the title. 2017 saw Rollins move away from his heel role and start to rebel against his former leader Triple H, leading to their unsanctioned match at WrestleMania 33, which is a technically good match, if about 5 minutes or so too long. The next match is the only one on the whole set to feature The Shield in their entirety teaming up, as they took on The New Day at Survivor Series 2017, which was by far the highlight of the Hounds of Justice’s disappointing reunion marred by injuries and poor booking. Rollins kickstarted the momentum that has so far carried him through a career year in 2018 with his 65-minute run in a gauntlet match on the February 19th episode of RAW. His portion of the match is featured here, as he kicks off against his on-again partner Reigns, defeating him to then go up against John Cena. Once the Architect outlasts the Cenation Leader, he ends up running into Elias, but by the time the vagabond guitarist manages to defeat him, Rollins has already created a legendary RAW moment which sparked his popularity with the fans. The final match featured is his Intercontinental Title win at WrestleMania 34 against The Miz and Finn Balor in a Triple Threat Match, which was among the high-end of bouts in a lob-sided Showcase of the Immortals in New Orleans. Disc 3 is all about the “Big Dog”, as we track the rocky road of Roman Reigns towards becoming “the guy” in WWE. Reigns’ collection begins with his first WWE Title victory against Dean Ambrose in the final of the mini-title tournament at Survivor Series 2015, ironically caused by an injury to Seth Rollins. The joy is short-lived as Sheamus then cashed in the Money in the Bank briefcase on him to win the title, but the December 14th 2015 episode of RAW sees Reigns win it back from the Celtic Warrior, at a time where Reigns was arguably the most popular he had ever been in his career. Any good will towards Reigns had evaporated by the time WrestleMania 32 rolled around, as his absolute bore-fest with Triple H in the main event saw him win the title back for the third time, with the fans in attendance completely disinterested. We fast-forward a year to WrestleMania 33, where Reigns managed to infuriate fans in a different way, by supposedly retiring The Undertaker in another weak main event – one retconned the following year when Undertaker returned. A potential WrestleMania main event that the fans could have enjoyed with John Cena instead takes place at No Mercy 2017, one that was preceded by both men doing worked shoot promos on each other. It doesn’t quite hit the mark, but it is far better than the two WrestleMania main events featured on this collection, as well as his second Brock Lesnar bout that does not make the cut here. However, we get their follow-up Steel Cage Match from the Greatest Royal Rumble in Saudi Arabia instead, which gets a better reaction than their WrestleMania 34 stinker, but the in-ring action is just as bad. “Justice for All” tells three stories in the tale of one stable – the wasted potential of Dean Ambrose that was affected by inconsistent booking and his triceps tendon injury at the end of 2017, the redemption of Seth Rollins towards becoming arguably the best overall performer in WWE today, and the fruitless pursuit towards making Roman Reigns the top man in the company, when the fans at large have clearly rejected him. This collection shows that while Vince McMahon and his team want to make one Shield member their top star, evidence points towards another member being a far more suitable candidate for that role. Although this is another essential DVD collection for Shield fans, other mat-watchers should avoid the Reigns disc like the plague.